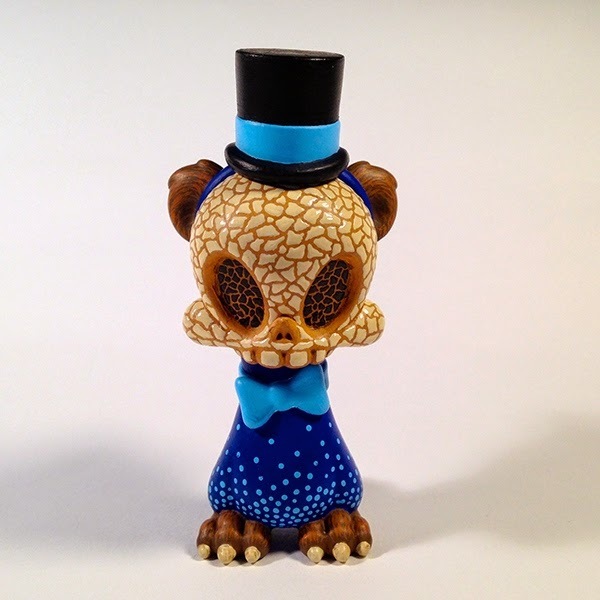 Barcelona based artist Jaume Bertran, aka Godhay Toys, recently completed a Wandering Misfit Kuma Skelve custom titled "Mildiu". Painted using acrylics, with matte and gloss varnish, the completed piece has some amazing details for such a small figure. The skull portion of the custom seems to represent a nice tile mosaic, while the rest of the figure has a bit more simple design. Be sure to check out more of Jaume's work on his Behance page. 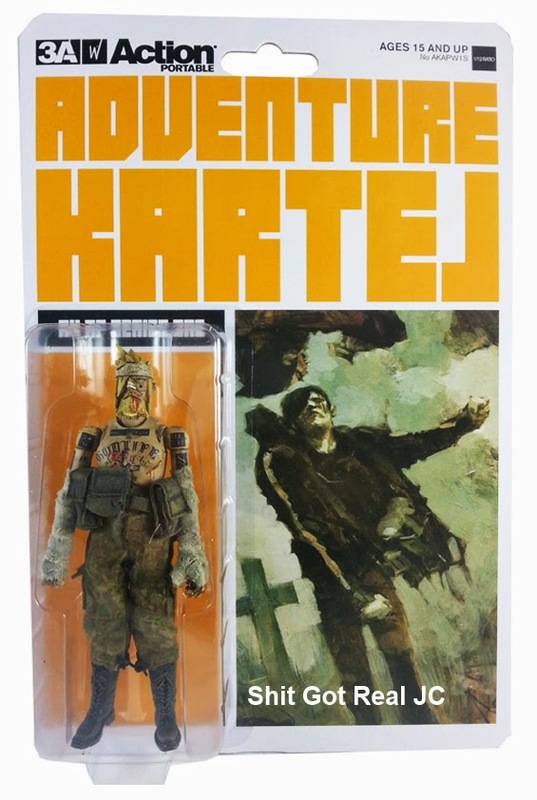 Artist Rask Opticon creates some amazing figures and art. Rask Opticon's latest revealed completed commission is based on the movie Wreck It Ralph. Creating both morphed King Candy and Wreck It Ralph, Rask Opticon used a couple of Vinylmation figures to complete the duo. While Ralph is pretty much an amazingly painted Vinylmation figure, King Candy (more specifically the body) is pretty much entirely sculpted from scratch. 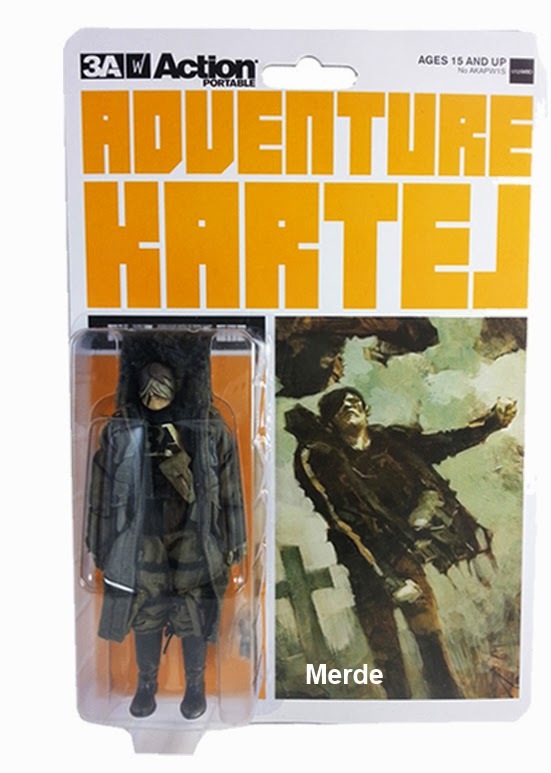 The end result is an amazing pair of figures that should make a collector very happy. Flying Sciurus Art, art of Shaun Nakasone, created the Death Prophet custom Kidrobot Micro Munny for the Charity Organization Extra Life. 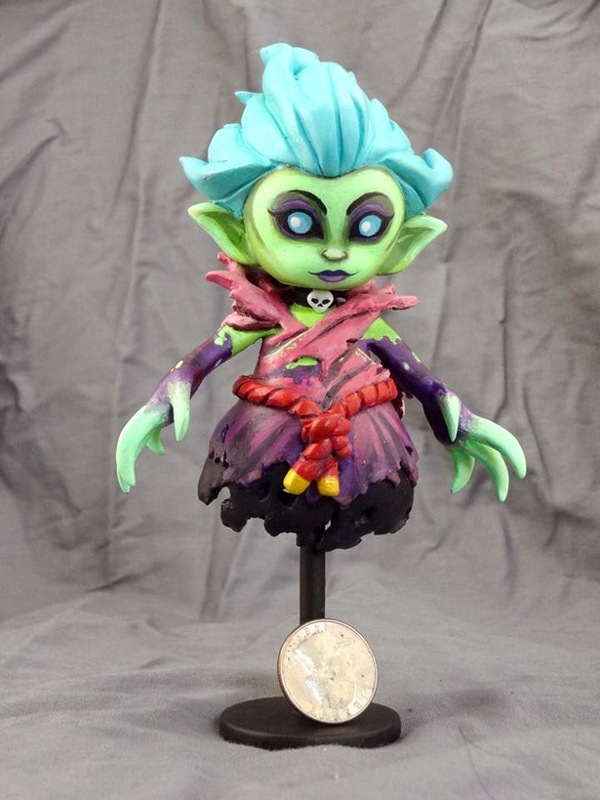 Using Apoxie sculpt and Super Sculpey, Shaun crafted the awesome Death Prophet based on a character from the game DOTA 2. With the base, the completed figure stands at around 7" tall and is currently up for auction on eBay here. 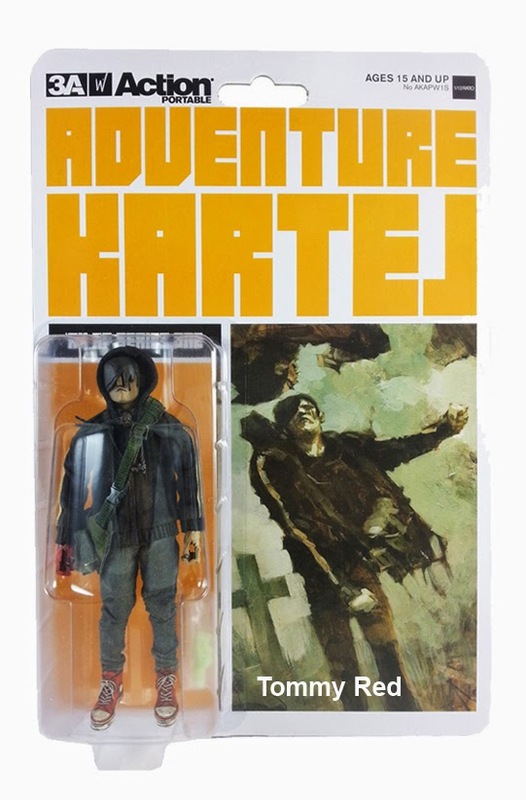 All of the proceeds(100%) from the sale of the figure will benefit the Extra Life charity event, with the auction running until November 2nd. In addition to the Death Prophet being auctioned on eBay, Shaun is going to be live streaming for 24 hours on his twitch channel, hoping to raise more money in support of the Extra Life charity event. Check out all the info on Shaun's Extra Life participant page. Support this great event! For now, only 3 of the 6 monsters have been teased, with the remaining 3 to be revealed shortly. 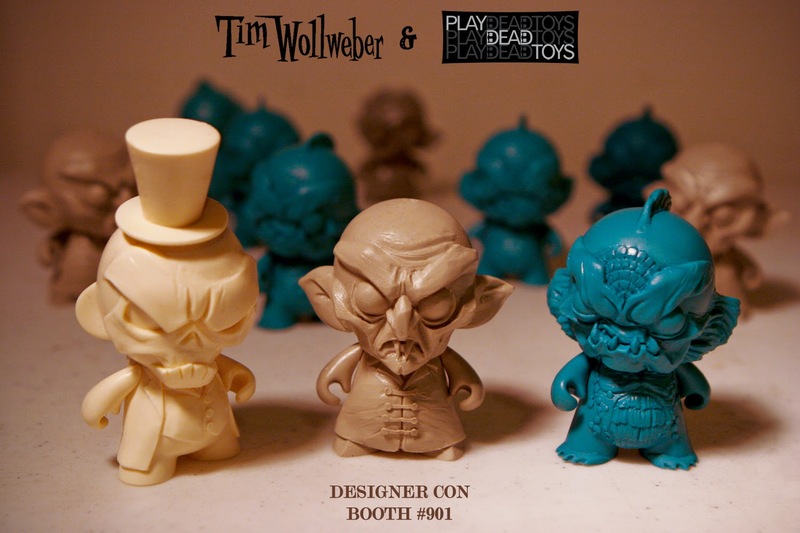 Tim will have all the micro monsters for sale at DCon 2014 Booth #901. 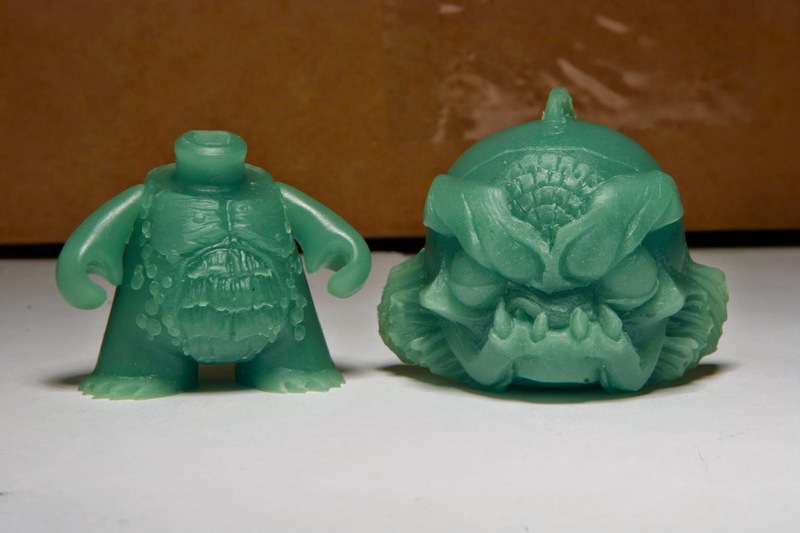 DIY colored resin versions of the micro monsters will cost $20 each, with a complete set of all 6 micro monsters priced at $110. 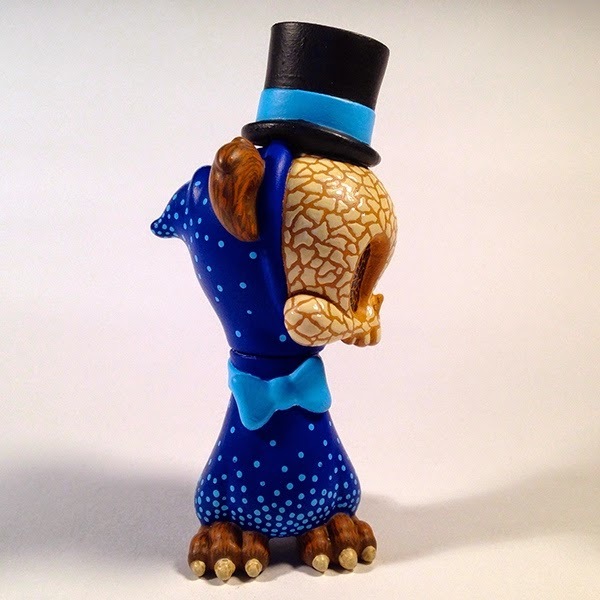 Tim is also going to hand paint a number of micro monsters with those priced at $80 each, or a complete set of 6 hand painted micro monsters for $425. 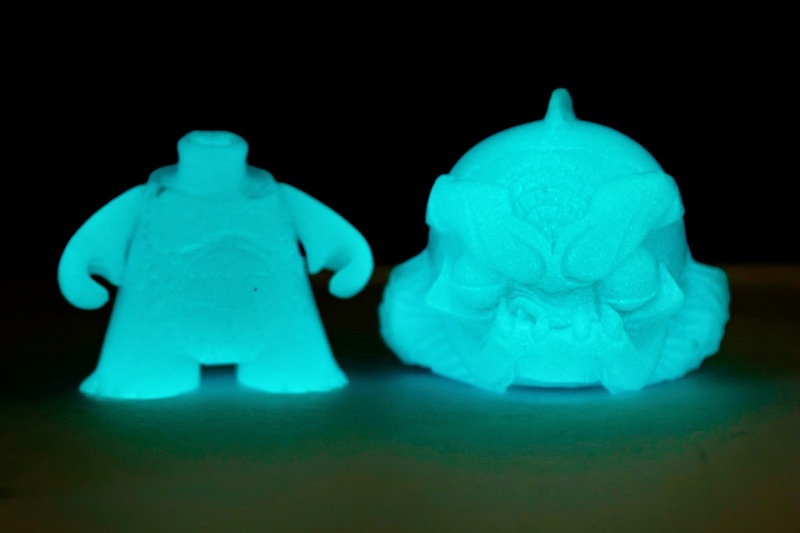 To add to all the resin micro monster madness, Play Dead Toys also cast a small number of resin Glow-In-The-Dark Bioluminescent Mer-Creatures, which will be priced at $45 each. Based on the provided photos, these GID Mer-Creatures will glow quite nicely. Not to limit the micro monster goodies to just one booth, Tim and Play Dead Toys will have an Exclusive "Onyx" colorway available at Spanky Stokes Booth #518. Limited to just 3 sets, each Onyx micro monster is priced at $45, while a complete set will cost $200. 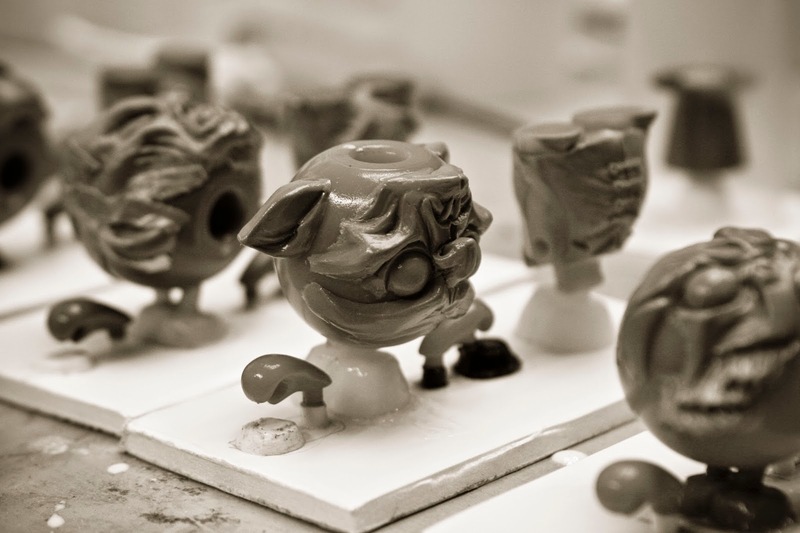 Below are a few production shots from Play Dead Toys, showing the casting of the micro monsters. 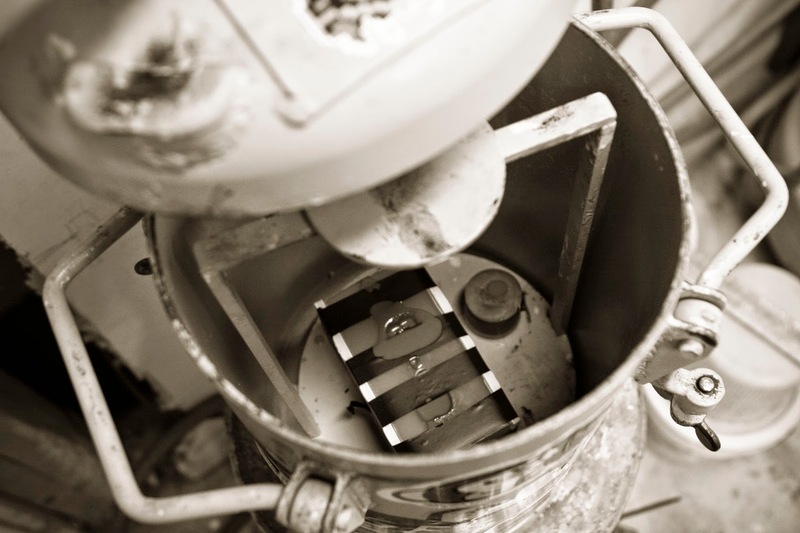 It's always nice to take a peak behind the scenes of a production line, no matter how big or small the line may be. 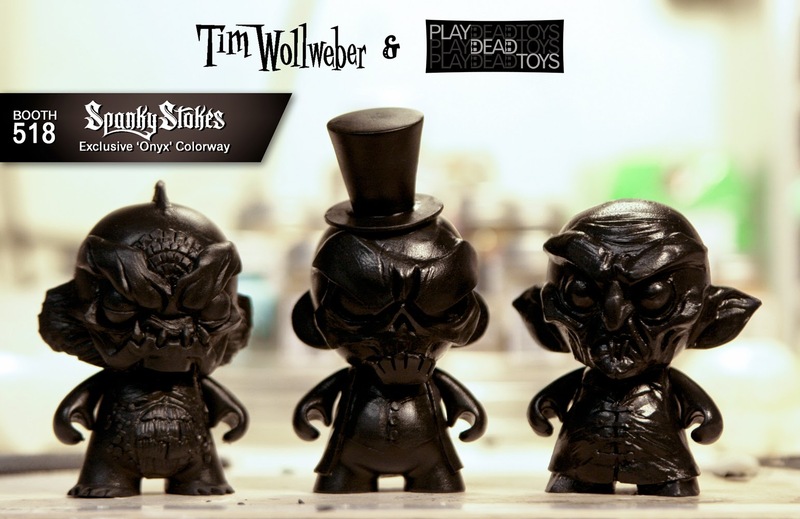 Be sure to follow Tim Wollwebber and Play Dead Toys as they reveal more goodies to be had in the future. 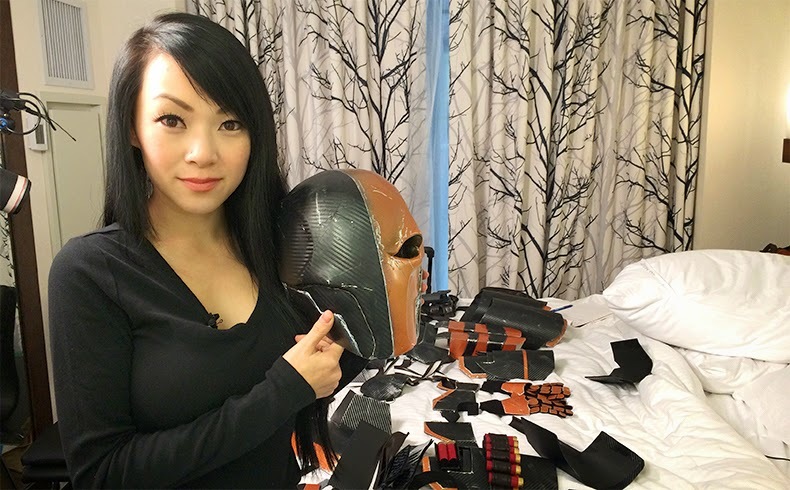 Cosplayer and artist Linda Le was recently featured on CNN for one of the "24 Hours with" pieces, as well as having a featured video on CNN Money. One piece is titled "24 Hours with A Comic Con Character", a CNN piece as told by Blake Ellis, gives readers a glimpse into Linda's life as a cosplayer. CNN followed Linda while she prepped her costumes and attended New York Comic Con 2014. All the while, talking about how she became a cosplayer and while touching a bit on the struggles of being a professional cosplayer. The "24 Hours with" piece features a main video titled "How I Became a Comic Con Star" (below), which is a featured video on CNN Money. The "24 Hours with" piece not only has the main video, roughly 2 minutes long, it also features a number of smaller videos taken throughout the day with Linda, to go along with a series of journal entries made by Linda. Overall, the "24 Hours with A Comic Con Character" piece is a small glimpse of what represents a typical event day in the life of Linda Le. Although the "24 Hours with" piece should have been titled something more appropriate, like 24 Hours with a Professional Cosplayer", it's great that Linda got the well deserved recognition. So, be sure to check out the entire piece on CNN and share it to everyone. Designer Con is a great event which features tons of artists and companies, with tickets only costing $5 bucks(when purchased in advance). Designer Con is also a time for artists to be able to purchase an affordable booth and show off his/her creations. This year at Booth #706, artist Cesar Diaz(aka Customations) is going to be selling many of his latest creations. 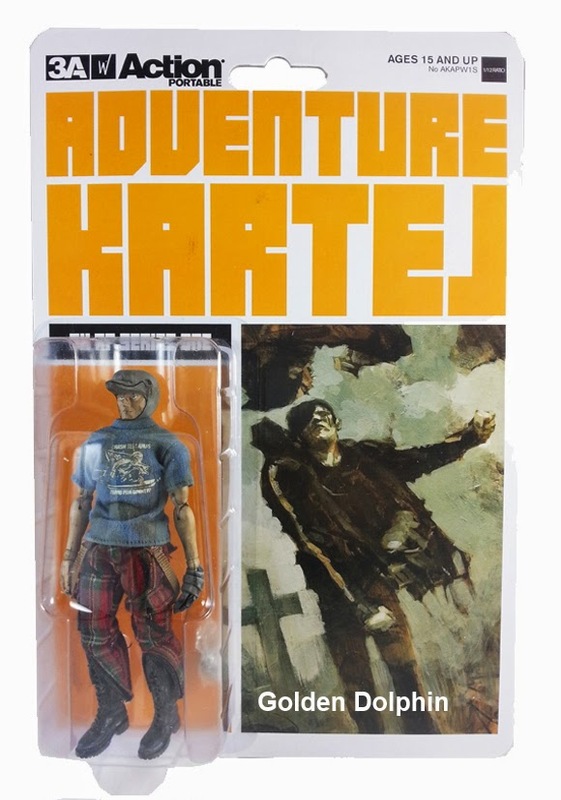 Everything from custom vinyl figures, to original 3D printed sculpts, as well as some resin pieces. 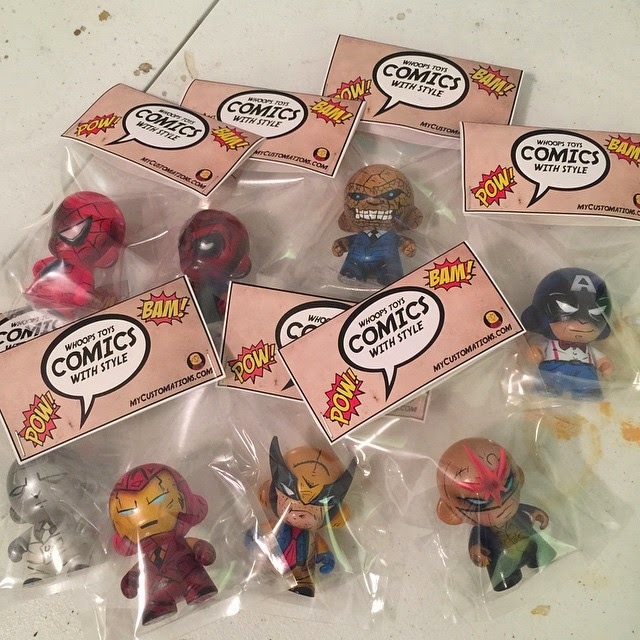 Something that stuck out is the custom series "Comics with Style", which features a number of custom Kidrobot Munny figures, painted to be a comic book character with a sense of fashionable style. 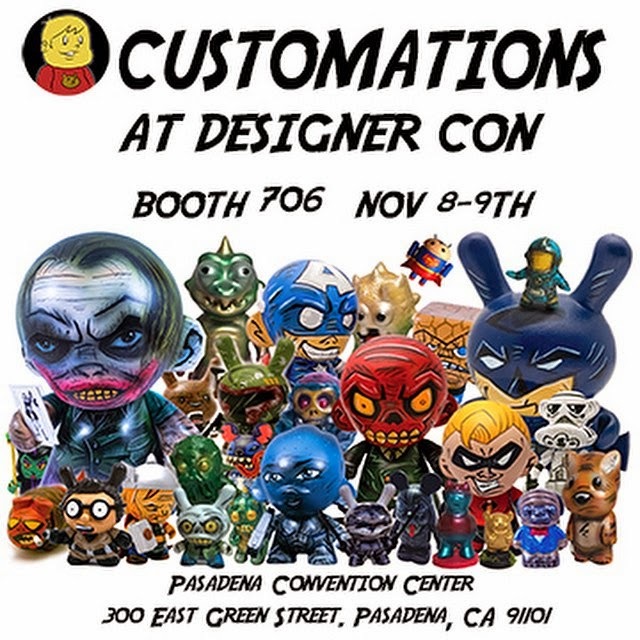 For those heading to Designer Con 2014, be sure to check out Booth #706 and show Customations and Time Frog some love. Art is wonderful and functional art is even better. Some time ago, artist JRyu started making his Sapling series. 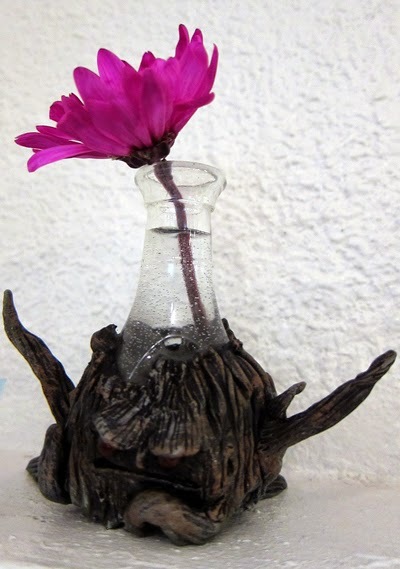 These Saplings sculptures are not only great pieces of art, but they double as small planters or vases. One of JRyu's more recent Saplings, "Dear Lazlo", is one of his larger pieces measuring around 9"x9.5"x10" and created for Rotofugi's 10th Anniversay 10x10 show. Lazlo is sold, but there are other Saplings in the wild, waiting to be purchased. Unfortunately, many Galleries don't have a social media correspondent or at least someone who regularly posts about available art pieces, new or old. It's typically, do some promotion for upcoming shows to get people in the gallery and maybe notify the world of available pieces afterwards. Back to JRyu and his amazing Saplings. 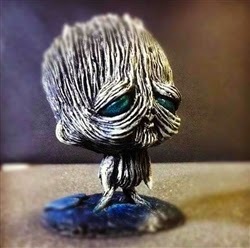 Available right now from Art Whino, are a number of JRyu's Sapling sculptures. 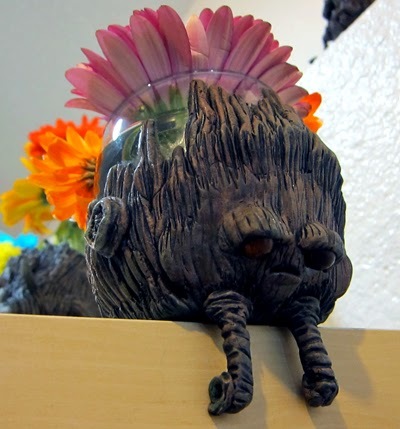 Most of JRyu's Sapling Sculptures are unique, each with it's own type of personality. Seen in the pictures are just a few of the available Saplings, waiting to be purchased and given new life as someone's vase or just as an art piece. 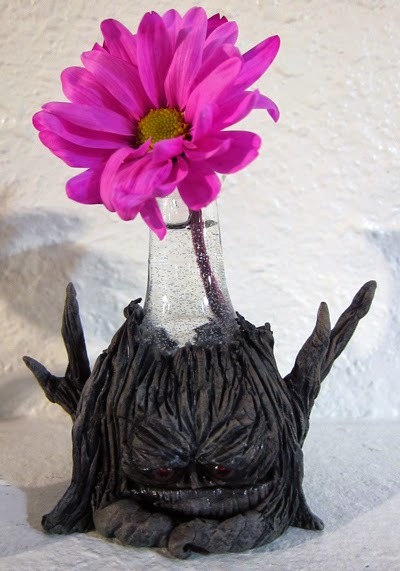 Each Sapling is either 4" or 6" in size, priced at $125 or $160 plus shipping, respectively. 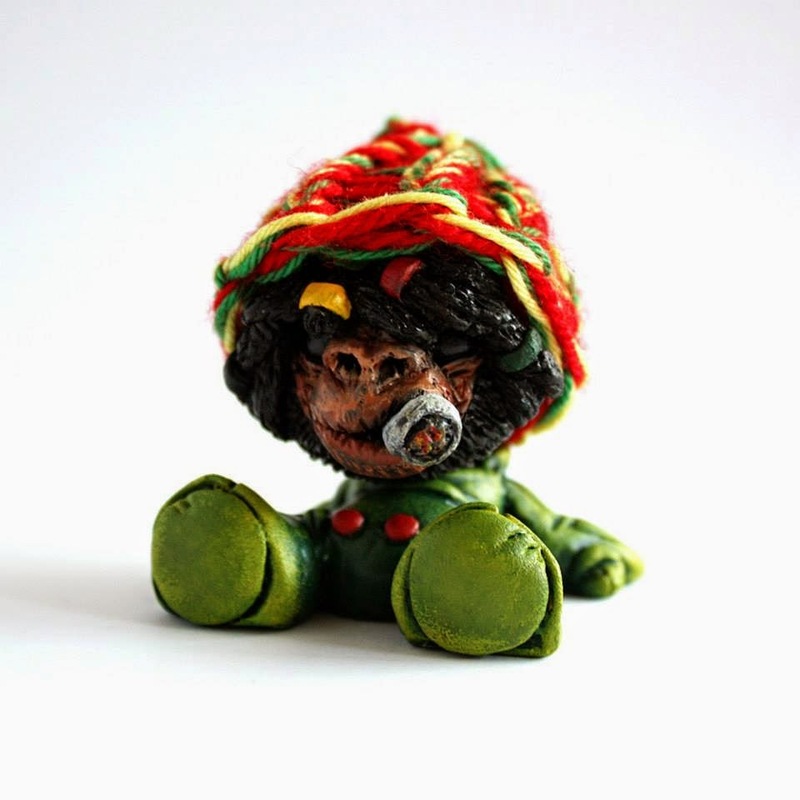 In addition to the one of kind JRyu Saplings through Art Whino, several retailers may still have some JRyu Baby Sapling Planters. 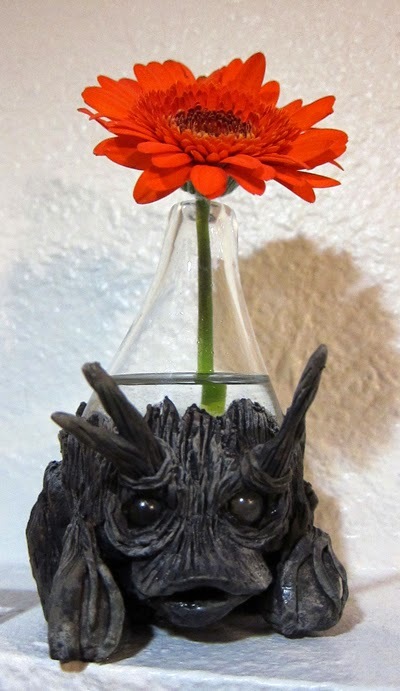 For example, right now, Tenacious Toys has some exclusive Baby Sapling Planters available for $50 plus shipping. Limited to 25 exclusive pieces, these little guys typically come bagged with a header card and make a great desk planter for succulents. As an aside, if any Galleries needs a person to actively promote available pieces of art, there might be some bloggers who would be available for hire. Just saying. 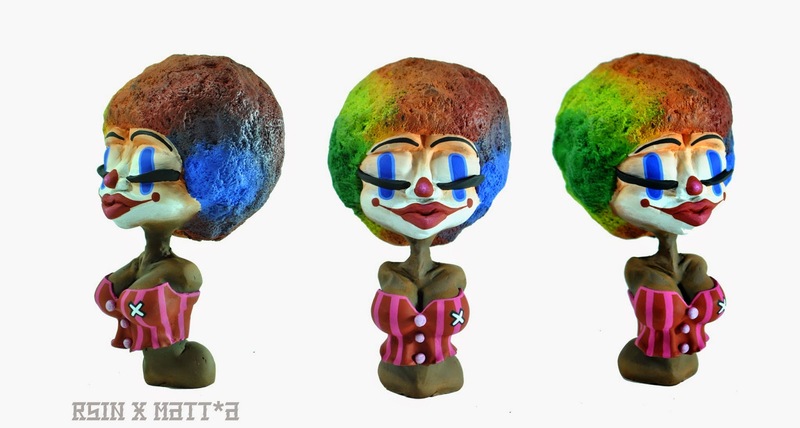 Available now through Rsin Art's online store is "Clown Bust". 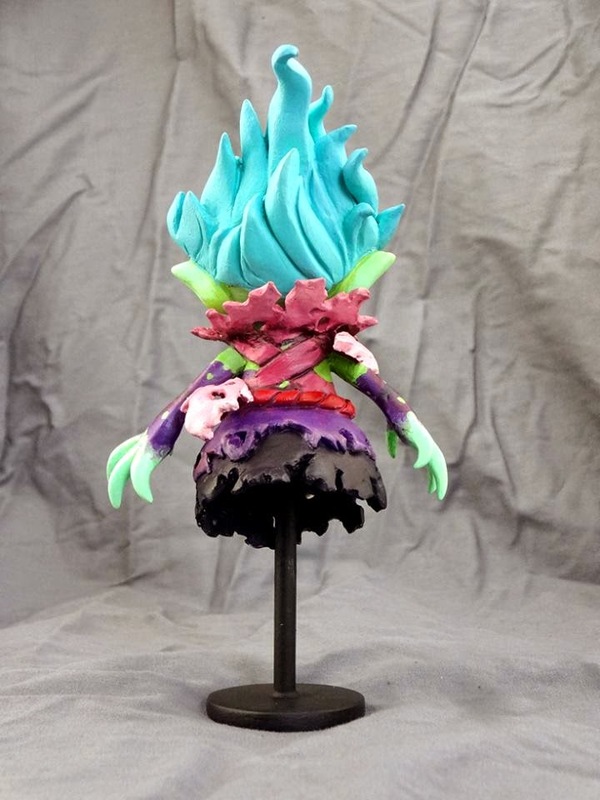 Sculpted by Matt*A, this original sculpt is about 9" tall, created using Magic Sculpt. Since Matt*A is pretty much colorblind, it was a good idea to have his buddy Rsin paint this piece up, providing the necessary color a clown would have. 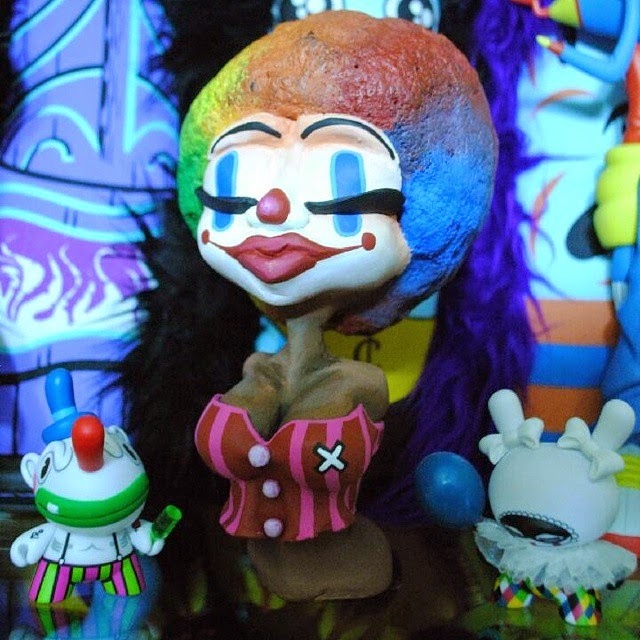 Priced at $250 plus shipping, this wonderful piece will go great in any clown themed collection or really, any collection that needs a pop of color. This piece, along with a few other of Rsin's art pieces, is available now through Rsin's online store. Make a purchase or at least spread the word, so these fine artists can continue making affordable art for the masses. 3D Printers are getting more affordable and attainable as more companies try to produce a newer and user friendly version. Between MakerBots, FlashForge and PrintrBot to name a few, 3D printers are helping people prototype and make stuff all around the world. So, when one of the best resin production people, Silent Stage Gallery, teased that they had purchased a 3D printer, the stage was set for some future awesome. 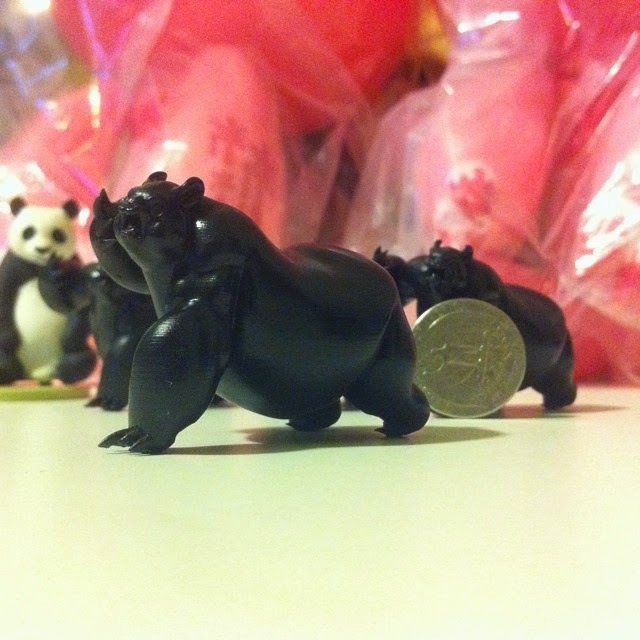 First up, of what will probably be many, is Angry Woebots' Mini Panda King 2 prototypes. 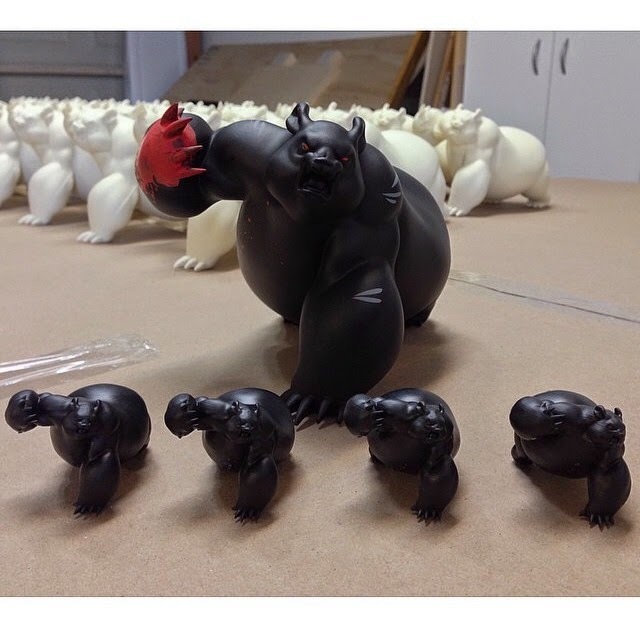 Aaron "Angry Woebots" Martin teased some pictures recently of a few Mini Panda King 2 prototypes. 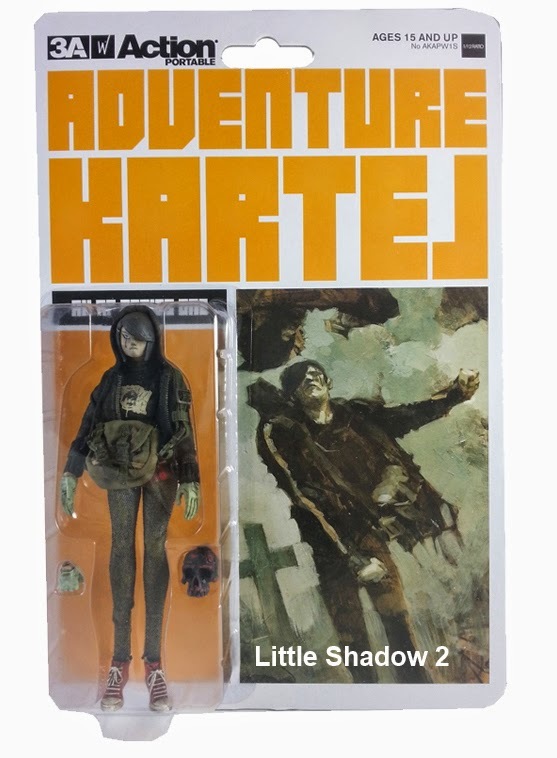 The prototype minis are 3D printed and depending on cost efficiency, for production may either be all be 3D printed or molded and cast in resin. No word on if or when these mini bad boys will become available, but with Designer Con 2014 around the corner, it's highly likely that Woes will be packing the mini heat. 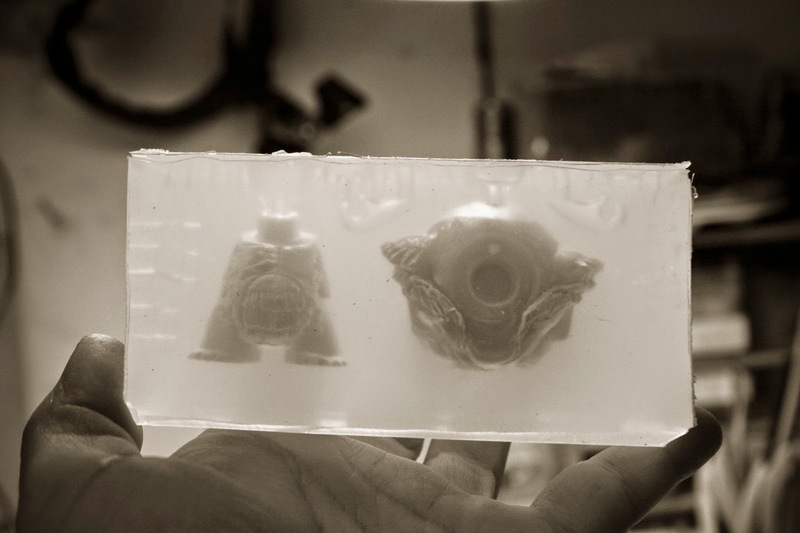 This is not the first time 3D printers have allowed artists to shrink down a design and go to print, MAD Toy Design did this in the past when he released his 3D Printed Micro MADLs. 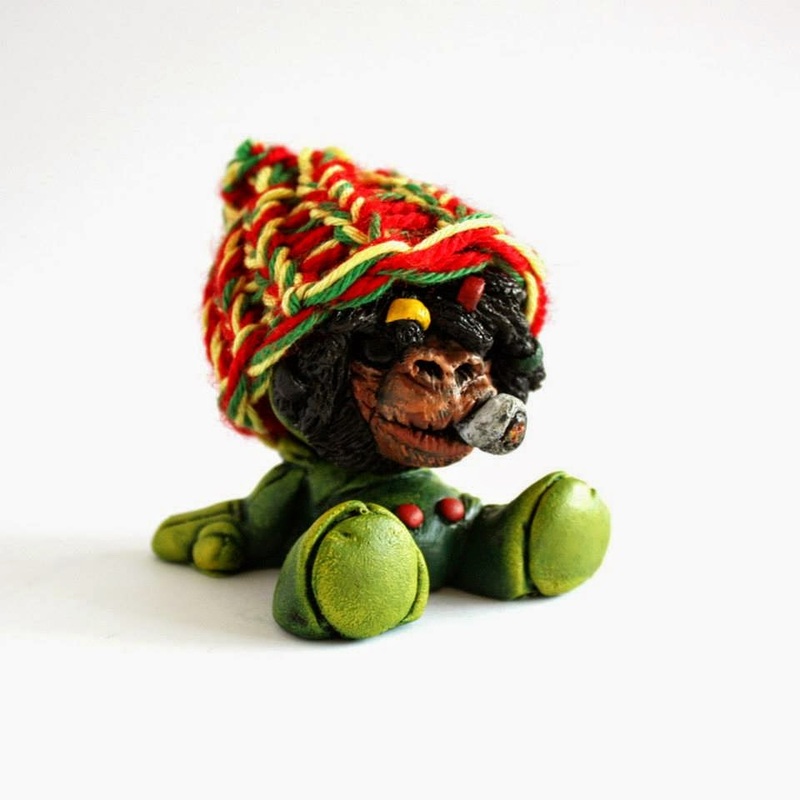 All of the Micro MADLs were 3D printed and allowed MAD to produce whatever color he wanted, albeit within the parameters of available filament color. 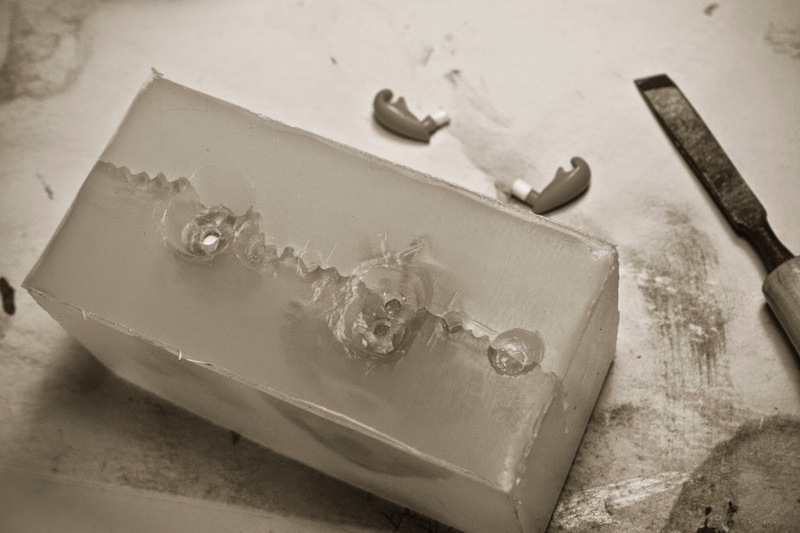 Other artists are also using 3D printing to prototype and build pieces that are eventually molded and cast in resin for production. Now, 3D printing is not for everyone, but still can be a wonderful tool for anyone. 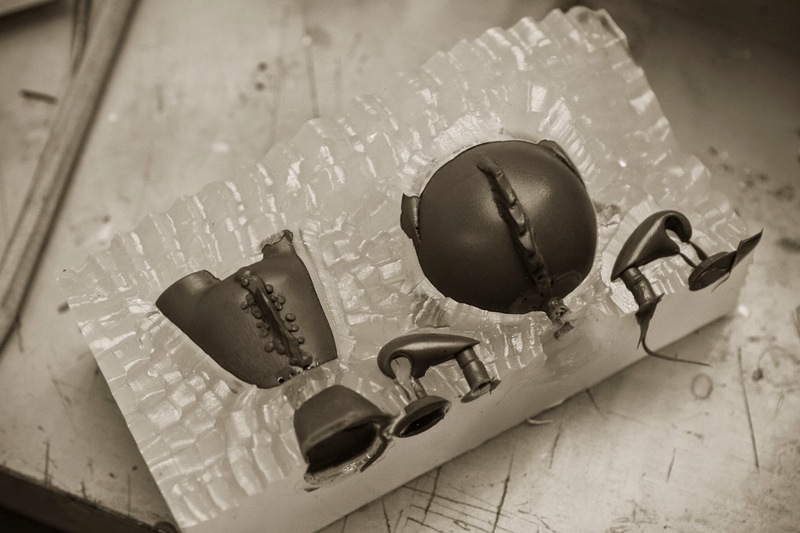 Considering the limited printing envelope, only time will tell how 3D Printing will help Silent Stage and Angry Woebots prototype in the future. One thing is certain, this can definitely be a game changer. 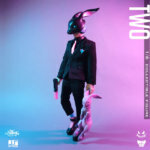 What are collectors hoping to see in the future from Woes and Silent Stage? Comment on this post and let everyone know. 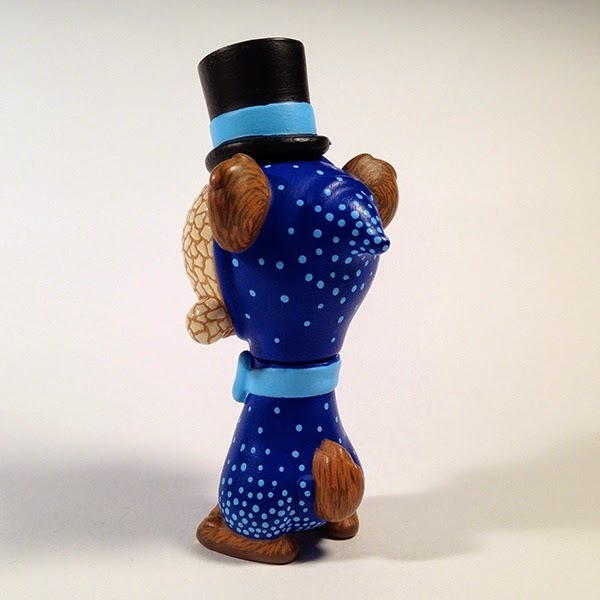 One of Don P's, aka Patrick Lippe, most recent pieces is a custom Lil' Jammie titled "Dopey". Using one of Fuller Designs' Lil' Jammie figures, Don P created a re-sculpted head, while keeping the rest of the initial figure intact. 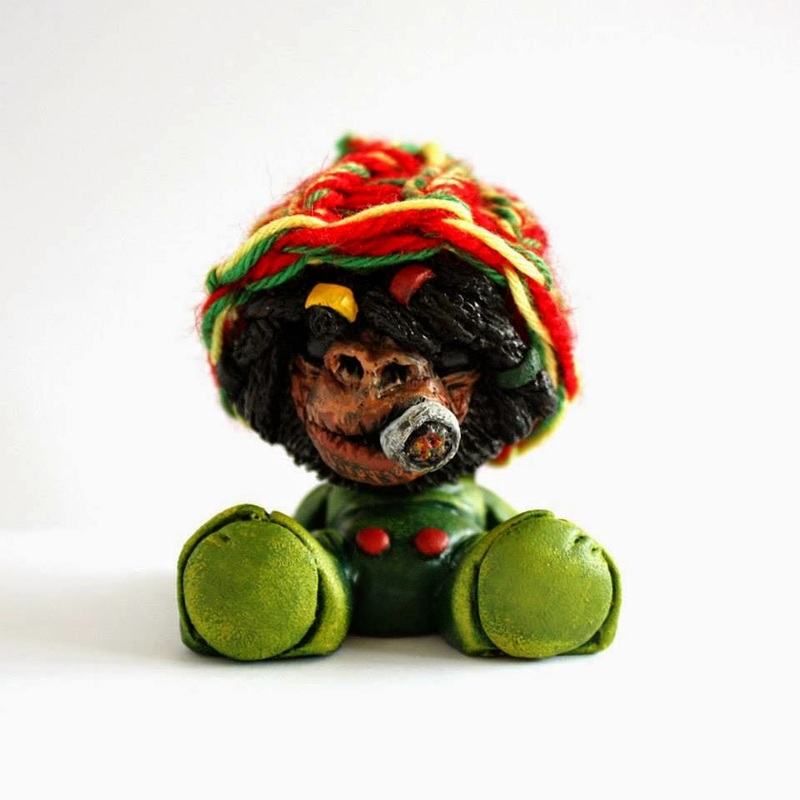 Complete with dreadlocks and a type of smoking piece, the added paint and details were not enough for Don P. Don P's solution was to ask his wife to create a knitted cap for the custom, which does complete the overall look of this custom Lil' Jammie figure. 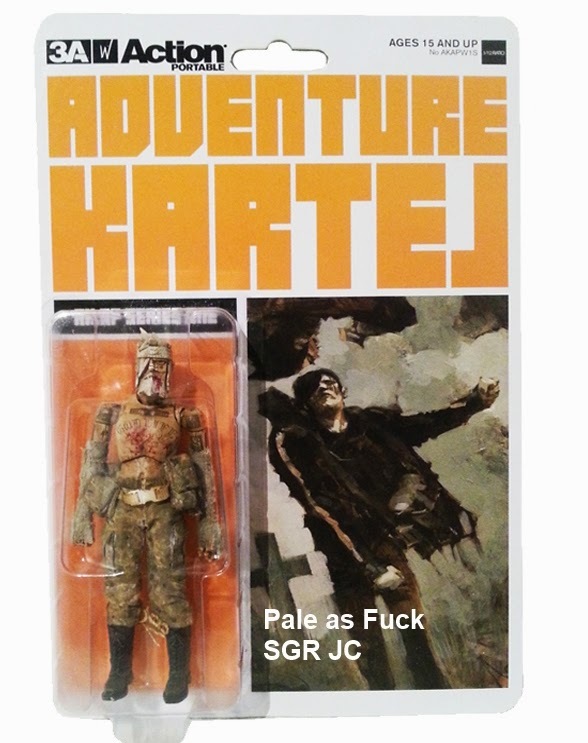 Since this piece seems to be a commissioned one, it is not for sale. However, anyone interested in his/her own commissioned Don P custom should contact him for more info. 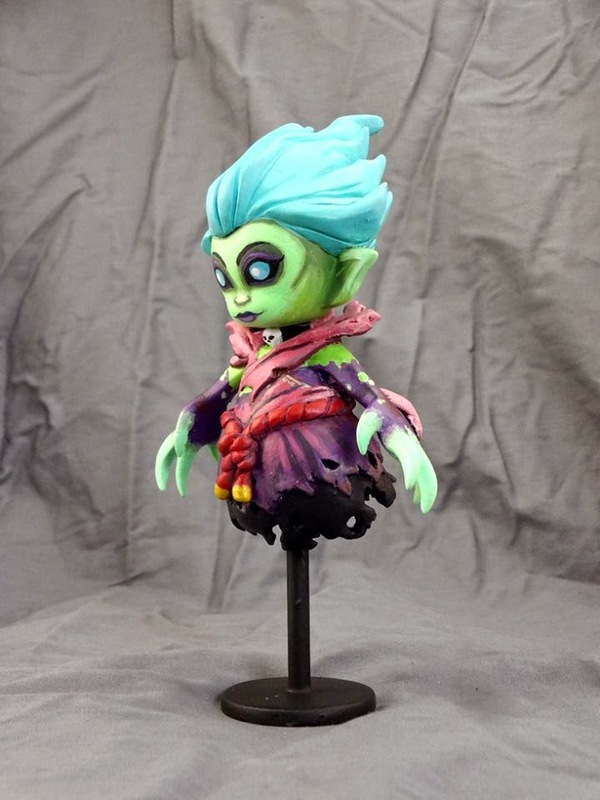 Rich Sheehan, artist of Toy Terror, recently completed a custom creation using a Coarsetoys' Omen figure. 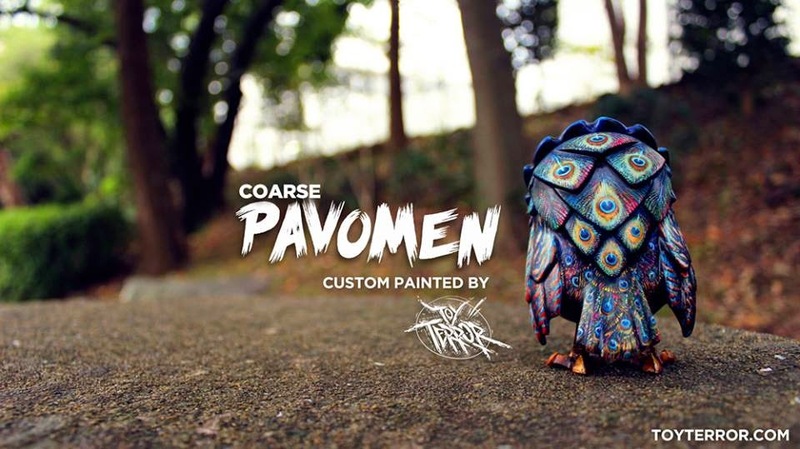 Titled "Pavomen the PeafOwl", this custom Omen figure is painted to be disguised as a "cunning and colorful peacock". 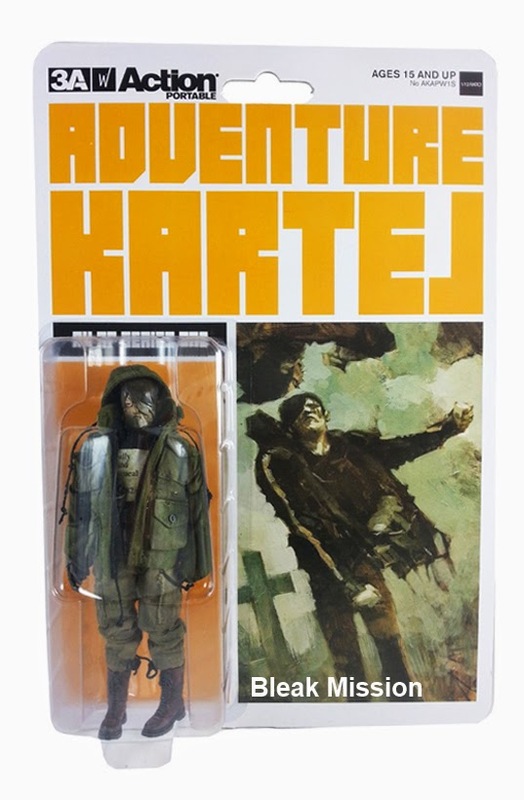 This was a commissioned piece, so it's not available, but anyone interested in a custom piece should contact Rich Sheehan at Toy Terror and get on his commission list. 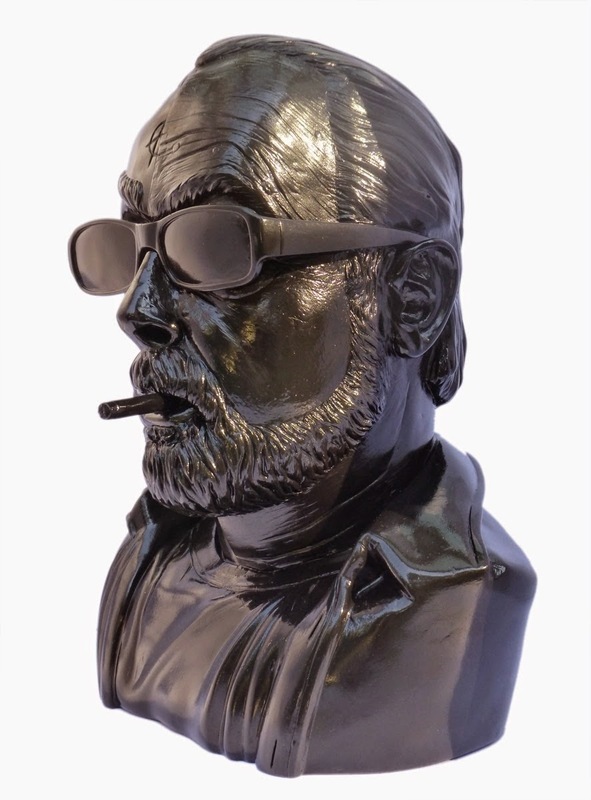 More than a year after launching a successfully funded Kickstarter to produce the Dead Kozik bust, artist Kevin Gosselin is working his way through his custom Dead Kozik bust list. 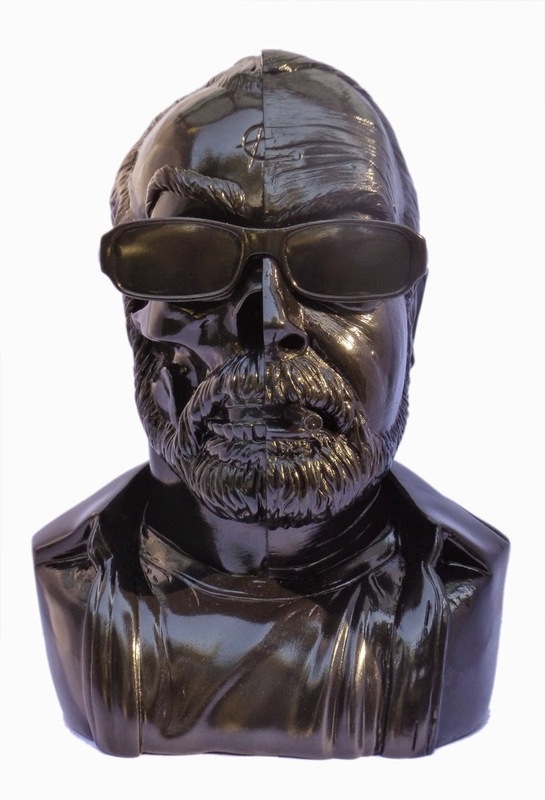 With 4 Kickstarter backers opting for the Custom Dead Kozik bust reward, Kevin had a good amount of work to put in. 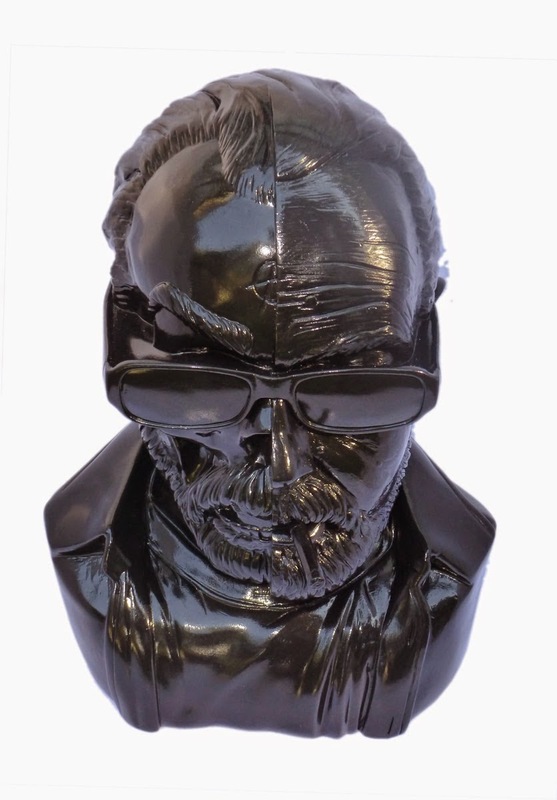 His latest custom Dead Kozik bust is titled "The Man Inside". 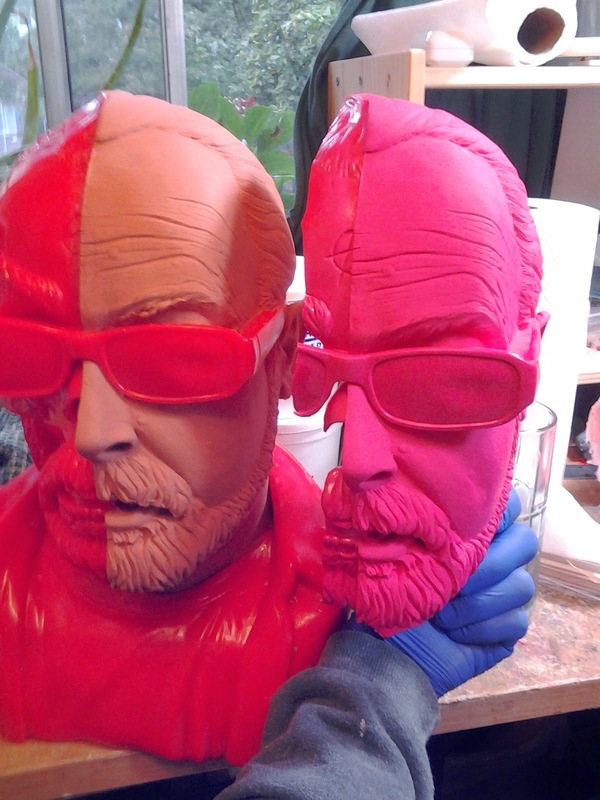 Essentially sculpting over half of the bust, Kevin recreated the flesh version of Frank Kozik. 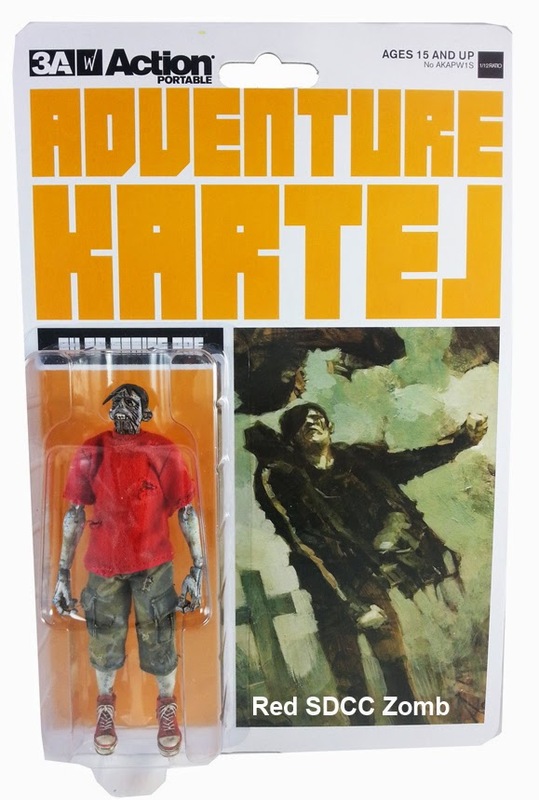 The end result is an amazing Jason Freeny-esque piece, which will definitely make a collector pretty happy. 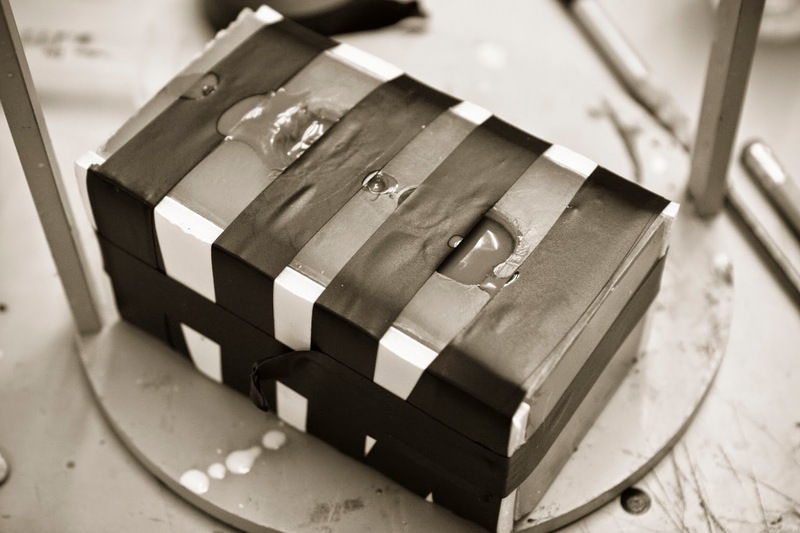 Oh, like with many of Kevin's projects, he decided to make a mold of the sculpt. 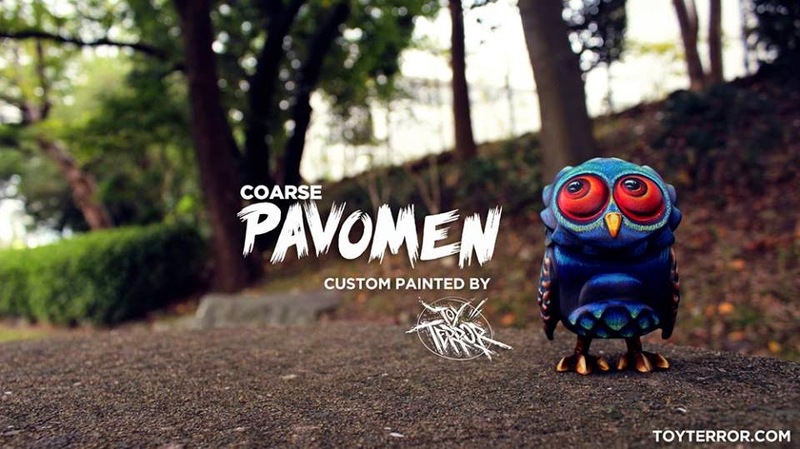 It's quite possible for Kevin to create more of these customs in the future. Stay informed by following Kevin on his various social media sites, or better yet, keep an eye on Kevin's website. 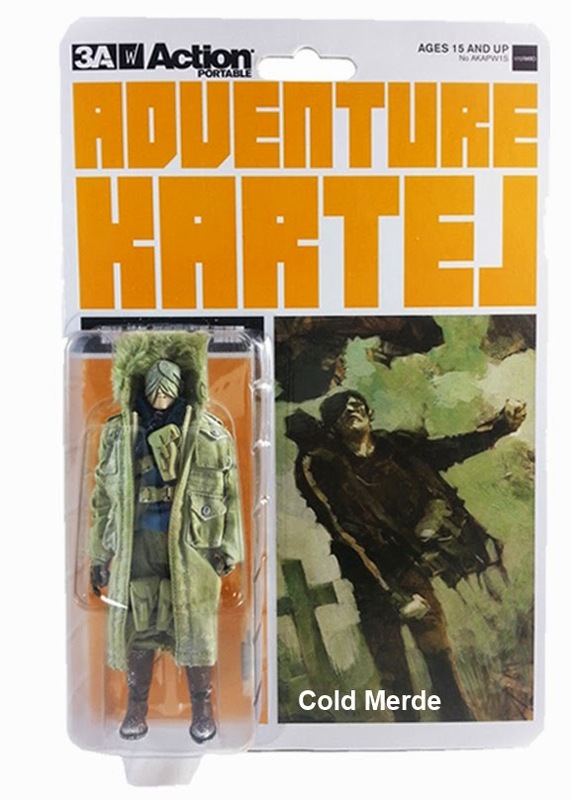 We now have all 14 of 3A's 1/12-scale Action Portable figures up for preorder on our website. I just paid them yesterday so once that payment clears, these items are shipping to us via Express from HK. 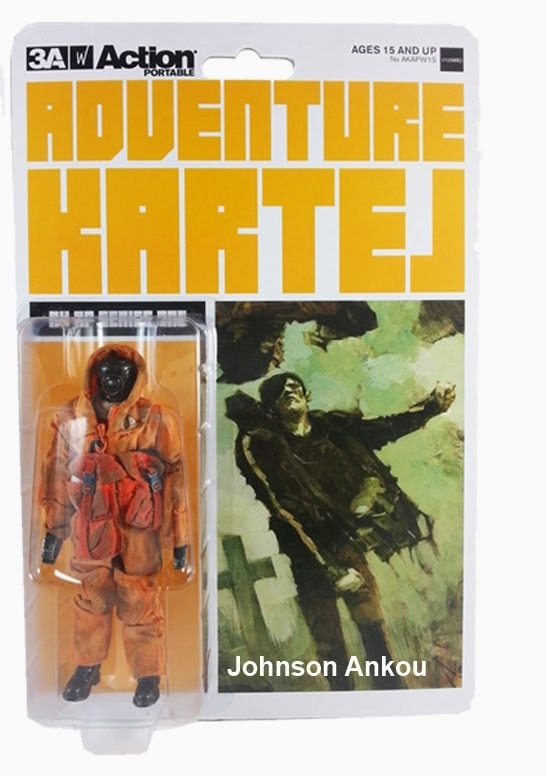 I figure an arrival date of around Halloween-ish. 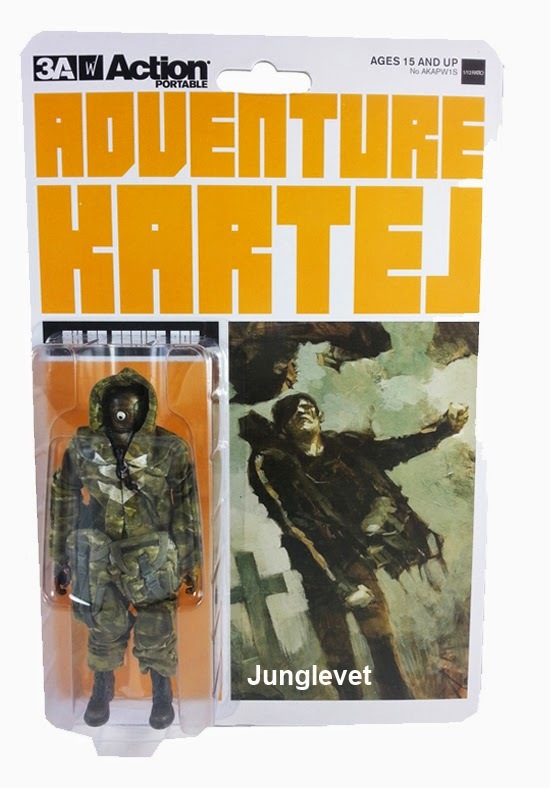 These are 6-inch-tall figures priced at $45 each- a bargain as far as 3A is concerned. 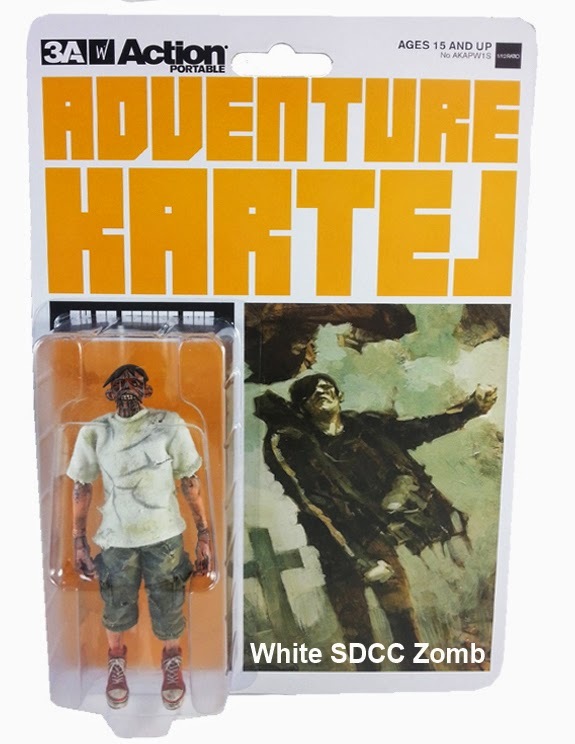 I ordered VERY limited quantities so if you're looking for a specific figure (esp Cherry Bomb, Bleak Mission or Cold Merde) please don't wait... I don't expect many of these to last long. Buy 3 or more of them and get free shipping in the US. 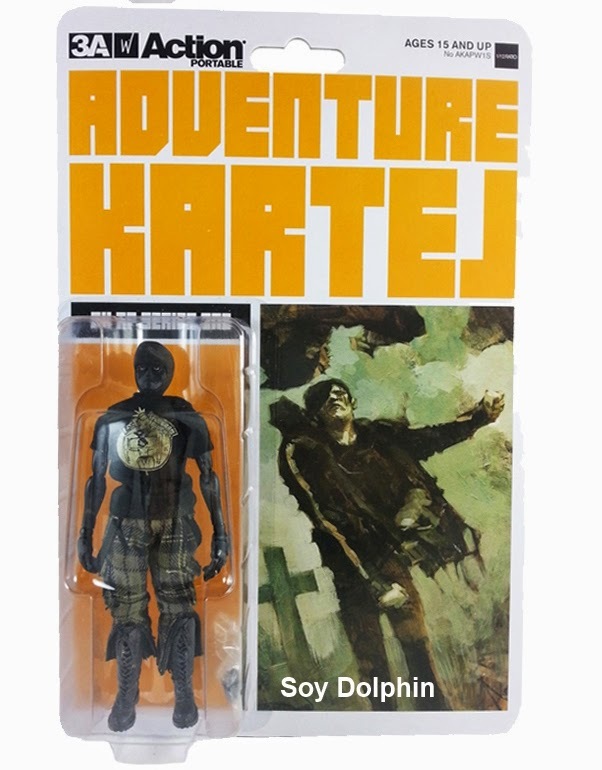 On a related note, I've dropped the price on the 2 different Michonne's Pet 1/6-scale figures to $100.